For information regarding recent bear maulings, etc., visit our Bear Update Page. Two specie of bear inhabit Yellowstone National Park: the black bear (ursus americanus), and the grizzly or brown bear (ursus arctos horribilis). Of the two specie the grizzly bear is the largest and most formidable. The weight varies from 325 to 600 pounds in this area, occasionally larger. Black bears weigh between 135 and 315 pounds. The term “Brown Bear” is the more correct and scientific use for the grizzly bear species. 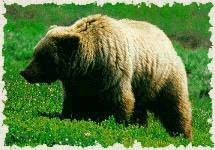 Grizzly is just common usage in the lower 48 having first been used during the Lewis and Clark expedition when they referred to “a brown bear with grizzled appearance”. (DeVoto) All grizzly bears are actually brown bears having originated in Eastern Siberia, the Russian brown bear. The black bear is the only native bear in North America (ursus americanus). “Black bears are primarily adapted to use forested areas and their edges and clearings.” Although grizzly bears will frequent forested areas they will make much more use of large, non-forested meadows and valleys than do black bears. In the early years of Yellowstone’s history bears were easily seen. Today, bears are a bit more difficult to spot, however, grizzly bears are most often viewed in large open meadows and black bears are most often viewed in timber. Knowledge about what foods bears eat will help in determining the best location for viewing. From March through May, ungulates, mostly elk and bison, comprise a substantial portion of a grizzly bear’s diet. Grizzly bears feed on ungulates (grass eaters) primarily as winter-killed carrion but also through predation on elk calves. Other items consumed during spring include grasses and sedges, dandelion, clover, spring-beauty, horsetail, and ants. Grizzly bears also feed extensively on whitebark pine nuts stored in red squirrel caches, especially during spring when an abundance of pine nuts have been left over from the previous fall (Mattson and Jonkel 1990). From June through August grizzly bears continue to consume grasses and sedges, dandelion, clover, spring-beauty, whitebark pine nuts, horsetail, and ants. In addition, thistle, biscuit root, fireweed, and moths are eaten. Predation on elk calves continues until late-June/early-July when grizzly bears are no longer able to catch calves (Gunther and Renkin 1990). In areas surrounding Yellowstone Lake bears feed extensively on spawning cutthroat trout (Reinhart 1990). Starting around midsummer grizzly bears begin feeding on strawberry, globe huckleberry, grouse whortleberry, and buffalo berry. By late summer bistort and yampa are included in the diet as grasses, sedges, and dandelion become less prominent. From September through October whitebark pine nuts are the most important bear food in the Yellowstone Ecosystem. Other items consumed during fall include: grasses and sedges, bistort, yampa, strawberry, globe huckleberry, grouse whortleberry, buffalo berry, clover, horsetail, dandelion, ungulates, ants, and moths. In healthy whitebark pine ecosystems, whitebark pine seeds are a rich and highly preferred source of food for a variety of birds and mammals including grizzly and black bears. Most whitebark pine cone crops are harvested by red squirrels who cut the cones down and bury them in mounds of forest litter called middens, or a cache. Because whitebark pine cones do not fall off the tree or drop their seeds the year they ripen and grizzly bears can not climb trees, grizzlies must rob squirrel middens to feed on whitebark pine seeds. The importance of whitebark pine seeds or “nuts” to the diet of grizzly bears in Yellowstone National Park and to wildlife in general is described in Kendall (1983) and Kendall and Arno (1990). Following bumper whitebark cone crop years pine nuts can dominate the food habits of bears for the entire next year. Bears can even locate cones under 6 feet of snow. Grizzly bears and black bears eat whitebark pine seeds whenever they are available. In average cone crop years bears feed on them from mid-August to late fall. Following years of bumper cone crops many cones remain in squirrel caches the next spring. When this happens, bears begin to feed on pine nuts as soon as they emerge from their winter dens. They are capable of locating and excavating cone caches under at least 6 feet of snow. Bears continue to feed on whitebark pine seeds as long as they are available and pine seeds from the previous year’s crop can dominate bear diets for the entire next season. Research demonstrating the importance of red squirrels and whitebark pine seeds to bears in the greater Yellowstone ecosystem (GYE) and documenting the critical role of over-wintered nut caches to bear behavior and nutrition is reported in Kendall (1983) and Kendall and Arno (1990). Ecology and bear use of alpine moth aggregations: Recent bear research documented that bears in the Greater Yellowstone and Glacier Ecosystems feed on army cutworm moths. From entomological studies it was known that these moths migrate in early summer from the Great Plains to spend the summer in the Rocky Mountains. In Yellowstone, army cutworm moths spend their days resting in the cool spaces between jumbled rocks in talus fields near the tops of some of Yellowstone’s highest peaks. The moths emerge at night to feed on nearby flower nectar. Research on bear use of moths in the GYE/GGE and the alpine ecology of army cutworm moths estimated the nutritional importance of this diet item; during peak feeding periods when moths are abundant, bears eat approx. 40,000 moths/day. Wild berries, especially huckleberries are key bear foods in the Greater Yellowstone Ecosystem. Research on wild fruit production reported in Kendall (1986) and Weaver et al. (1990) examined annual production trends of several species of fruiting shrubs and found that huckleberry crops were the most favored. Fluctuations in yearly weather patterns probably account for crop size each year. Some years are better than others with more berries produced. The food habits of black bears in the Yellowstone ecosystem are similar to those of grizzly bears. The primary difference is the absence of roots in the diet of black bears (Knight et al.1988). Black bears have short curved claws better suited for climbing than digging. In contrast, grizzly bears have longer straighter claws and a larger shoulder muscle mass which makes them more efficient at digging for food items in the soil such as roots, bulbs, corms, and tubers, as well as rodents and their caches (Herrero 1978). Both grizzly and black bears hibernate during the winter, but are not considered true hibernators. Prior to 1970 bears were commonly observed throughout Yellowstone National Park. Black bears learned early on in park history that tourists brought food and that sooner or later a stage coach, and then later, tour busses would stop and people would get out and feed them. All bears are opportunistic in locating food so black bears were often found along roads and within developed areas. Grizzly bears on the other hand frequented the open pit garbage dumps that were located off the roads where food scraps and refuse was deposited from the nearby motels and restaurants in Yellowstone National Park. Grizzly bears are not as tolerant of people as black bears and never really hung out near the roads like the black bears. Having readily visible bears in Yellowstone Park was very popular with park visitors. It was also “considered to be the primary cause of an average of 48 bear-caused human injuries per year from 1930 through 1969.” (Cole; 1974 Yellowstone National Park Bear Management Order-4). In 1970 the park service initiated an intensive bear management program designed to restore the grizzly and the black bear populations to subsistence on natural foods and reduce bear-caused injuries to humans. Regulations prohibiting the feeding of bears are strictly enforced as well as regulations requiring human food to be kept secured from bears. The garbage dumps have been removed and all dumpster’s and cans have been bear-proofed. To safely view bears on your own in Yellowstone park use a strong spotting scope. Grizzly bears are active primarily during the night (nocturnal) and at dawn or dusk (crepuscular). Grizzlies are often viewed between Canyon and Fishing Bridge, the northern range of the park, and from Mount Washburn. Black bears are often active during the same time periods but can also be found during the day as well. Black bears are often viewed near Tower Falls, the Lamar Valley, and Roosevelt Lodge but can be found in many other locations throughout the park. Never approach a bear or any wildlife. Feeding bears or any other wildlife including birds in Yellowstone is unlawful and can result in arrest or citation. Bear Spray or Pepper Spray is allowed within Yellowstone National Park. Here are my recommendations: Bear Attacks, what to do, what to carry click here. Camping safely with grizzly bears in Yellowstone Park click here. Bear Caused Injuries and Deaths In Yellowstone Park—per year, click here. Female Menstruation. Should you worry?—Read the data. Color Can’t Be Used For Identification! Most visitors attempt to identify bears by color alone and often mistake cinnamon phased black bears as grizzlies. Most, but not all grizzly bears have a large muscle mass or “hump” over the front shoulders. The size of the muscle mass varies from bear to bear but most will have a well defined hump. The hump and dish face profile usually gives it away but sometimes you have to look at various different aspects of the bear you are watching to determine correct specie. Color: varies from pure black to brown, cinnamon orange or blonde; in the Rocky Mountains, approximately 50% are black with a light brown muzzle and 50% are cinnamon phased. “The grizzly bear population within the Yellowstone ecosystem is estimated to be approximately 280-550 bears. Depending on which government agency you speak with, the number of grizzly bears will vary widely. My personal “guess” on the actual number, based on years of field time, would be somewhere around 380. Identifying which specie of bear made the track you might find on a trail is rather simple. Looking at the front toes only, draw an imaginary straight line across the bottom of all toes (as shown in example) on one of the front tracks only. Left or right foot are the same, so pick the best one to examine. If all of the toes line up above the straight line, its a grizzly bear. If the lower half of the little toe goes into or below the line it is still considered a grizzly track. Black bear toes are more arched (as shown in example). If the upper half or more of the little toe lines up below the straight line its a black bear track. Most folks attempt to identify bear tracks by looking at the size of the track or measuring the length of claw, which does not work. It could be a large black bear or small grizzly. Claw marks are often not visible unless left in very wet mud, or snow. The size of the home range of an individual grizzly bear will vary depending on the concentration and types of food sources. The more concentrated the food sources the less a bear will have to travel in search of food. The size of the home range varies from one geographic region to another and also from one year to another. Some years are better with more food available and individual bears may use much smaller areas during those “years of plenty”. Research has shown that adult male grizzly bears living in Yellowstone National Park have an average home range of approximately 632 square miles. In comparison, grizzly bears living along the coastal areas of Alaska and feeding on salmon require only about 10.5 square miles. The difference is access to adequate and abundant food items. Males (boars) will generally have a home range which is four to six times larger than females (sows). The home range of a mature male bear will normally overlap the home range of at least two or three females and at least 4 or 5 males, possibly many more. Females will have small home ranges. The size varies and depends on age of cubs, food availability, etc… Grizzly bears do not normally defend their home ranges from other bears and are non-territorial. It is common for the home ranges of individual bears to overlap each other. Older, larger males typically are more dominant and will often control carcasses, or other high energy food sources within the area. A home range does not constitute one large area but rather is comprised of many food source areas connected by travel corridors. The home range must also include rest areas and more remote areas for shelter, protection, and denning. An adult male grizzly in Yellowstone park can use up-to 1500 square miles during summer, depending on food resources. Although not true hibernators, both grizzly bears and black bears den up during the long winter months in Yellowstone Park. Black Bears: Because of their short claw length and lack of muscle mass on the shoulders, black bears tend to locate natural openings for denning sites. They often scrape out areas under large boulders or logs, under buildings, inside culverts, or in a tree cavity. Black bears prefer steep southern slope exposures of 20 to 40 percent slope, often at elevations lower than grizzlies. Grizzly Bears: Sixty-one percent of brown bears in Yellowstone Park den on north slopes at elevations from as low as 6,500 feet to more than 10,000, but most are dug between 8,000 and 9,000 feet. Fifty percent of all grizzly bear dens are dug under the roots of a tree that tends to give the roof support. The other 50% are dug on an open hillside with no roof support. Preparing a den typically occurs in late summer while the bear is in hyperpagia (mass feed) to build up fat. 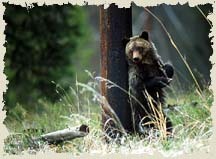 Bears are very secretive of their den sites and will abandon the site if disturbed. During late summer and early fall all bears have the need to gain as much weight as possible. Through the harvesting of available nut crops, fish, berries, carcasses, etc., brown/grizzly bears make very large weight gains. Such gains may be as much as 40 pounds per week. During this period, foraging may occur around the clock with only short rest periods. The triggers to enter the den are a combination of the first heavy snow, a reduction in the supply of high-quality foods, decreased mobility due to snow, and increased energy costs of keeping warm. Basically, there could be several feet of snow on the ground and snowing heavy but if there is a high protein food source like a bison carcass nearby a grizzly or black bear will stay out and continue feeding. Pregnant sows will den first, older males last. Hibernation is an energy-saving process bears have developed to allow them to survive long periods when there is insufficient food available to maintain their body mass. As they run out of food sources and stop eating they become increasingly lethargic and the bear will enter the den site they constructed earlier in late fall. While hibernating, a bear’s heart rate drops from between forty and seventy beats per minute to only eight or twelve beats per minute and its metabolism slows down by half. Unlike many other animals who hibernate its body temperature only undergoes a minor reduction of 5 to 9 degrees Fahrenheit. During the hibernation period all bears lose a great deal of weight. Adult males and adolescent bears lose between 15% and 30% of their weight while it is not uncommon for a female with newborn cubs to lose as much as 40% of her weight. The trigger to exit the den is: snow melt. Large adult males and single or poorly conditioned bears will exit first and then sows with cubs of the year (newborn) last. The bear is typically lethargic and will lay around on the “porch area” for some time and may re-den if winter conditions return. If warm weather continues the bear will seek out water or eat snow, roots and herbs to clear kidneys and digestive system and then any winter-killed carcasses, or more recently, wolf kills. The physiological aspects of a hibernating bear are rather unique. They do not eat, drink, defecate or urinate during hibernation. The digestive system and kidneys shut down almost completely. The bears exist on foods and fluids stored in their bodies. Poisonous wastes and byproducts are broken down and reabsorbed; urine is reabsorbed through the bladder wall and processed into amino acids and protein. Bears do not lose bone mass during hibernation. All other mammals which maintain non-weight bearing positions for an extended period of time suffer from osteoporosis, or a weakening of the bones (Wickelgren 1988). Female grizzly bears normally become sexually mature in their fifth year. Mating normally occurs between late May and early July. Females will normally mate with as many males as they can over the 3-4 weeks of the breeding season. Females will not come into estrus and mate when they are nursing or raising cubs, about 3-4 years. Through a process referred to as delayed implantation, the fertilized ovum divides a few times and then floats free within the uterus for about six months with its development arrested. Gestation begins at the start of denning. Sometime around the denning period the embryo will attach itself to the uterine wall and after a period of eight weeks (January or February) the cubs will be born while the mother is still in hibernation. Delayed implantation clearly serves an important survival need for the mother. Should she not have enough fat reserves to carry her through the winter, the embryo will not implant and it is simply reabsorbed by her body. The number of cubs born normally ranges from one to four with 2.4 cubs being average. Climate, DNA and food supply are important in determining of the size of the litter. Recent research points to the sow’s ability to give birth to cubs from different boars, which would indicate that females produce eggs at different times throughout the breeding period. At birth the cubs are blind, toothless, hairless and very small. They weigh 21 to 25 ounces. About the size of a chipmunk. As soon as they are born they will nurse on their mother who remains asleep. This is the only time in a bears life when it will eat while in hibernation. The mothers milk is very rich containing over 20% fat. In contrast human milk only contains about 4% fat. However, bears do not suffer from hardening of the arteries or gallstone. Conditions which result from high levels of cholesterol in humans. The bear’s liver secretes a substance that dissolves gallstones in humans without surgery. During the remainder of hibernation period, the cubs will develop rapidly on this rich diet and weigh on average of 50-60 pounds when the family group exits their winter den in spring. The cubs will normally stay with the mother for the first two and a half to 3 years. The cubs are generally weaned between July and September of their first year. The entire family group; mother and cubs will den together for the next two winters. The survival of grizzly bear cubs is totally dependent on the the mother in both protecting them and teaching them the basics of what to eat, where and how to get it, where to den, and how to deal with danger. As young 2 or 3 year old sub-adults they are driven off by their mother and large adult males as the female prepares to breed once more. Males are drawn in by scent. The 3-4 year old sub-adults must now travel alone without mothers help and find sufficient food to build up their fat reserves to last over the long winter. Sub-adults (3 – 4 year olds) will often spend that first summer and winter with their siblings (brothers and sisters) and occasionally even pickup young castoff sub-adults from other females, and will then travel in a group for safety. Black bear sows kick their cubs loose as yearlings or two year olds. “Bear Attacks: Their Causes and Avoidance,” by Dr. Stephen Herrero. Published by Lyons and Burford. Bagget, J.A. 1984. Hibernation. Science World. 40(10):8-11. Gunther, K. A., and R. A. Renkin. 1990. Grizzly bear predation on elk calves and other fauna of Yellowstone National Park. In t.Conf Bear Res. and Manage. 8:329-334. Herreo, S. 1985. Bear Attacks – Their Causes and Avoidance. Winchester Press, New Century Publishers, Inc., Piscataway, N.J. 287pp. Knight, B. M. Blanchard, and D. J. Mattson. 1988. Yellowstone grizzly bear investigations: Annual report of the Interagency Grizzly Bear Study Team, 1987. U.S. Dep. Inter., Natl. Park Serv. 80pp. Mattson, D. J., and C. Jonkel. 1990. Stone pines and bears. Pages 223-236 in Proceedings-Symposium on Whitebark Pine Ecosystems: Ecology and Management of a High-Mountain Resource, U.S. Dep. Agric., For. Serv. 386pp. Mealey, S. P. 1975. The natural food habits of free-ranging grizzly bears in Yellowstone National Park, 1973-1974. M.S. Thesis, Montana State Univ., Bozeman. 158pp. Reinhart, D. P. 1990. Grizzly bear habitat use on cutthroat trout spawning streams in tributaries of Yellowstone Lake. M.S. Thesis, Montana State Univ., Bozeman. 128pp. Sanders, K.D. 1990. Safety guidelines for hiking, photographing, filming, and observing grizzly bears. Self published. 20pp. Sanders, K.D. 2001. Gallatin Canyon Bear Proof Trash research project. Unpublished 6p. Wickelgren, I. 1988. Bone loss and the three bears: A circulating secret of skeletal stability. Science News. 134 (26):424-425.